Today we’re going to Review the Top MySQL (SQL) Management and Performance Monitoring software and tools that will help you dial in your SQL servers as well as fine tuning their performance and speed. MySQL is a powerful Open-Source Database Management System that helps companies to run a range of different applications such as websites and ERP storage systems. In fact, a DBMS like MySQL is a critical resource for any organization because of the many crucial tasks it does to keep the applications up and running. This is why you need MySQL monitoring tools to ensure that your database management system is in good health always. MySQL Monitoring Software and tools make it easy for DB administrators to monitor and fine tune their databases. Here are some of the best MySQL monitoring software and tools available today. 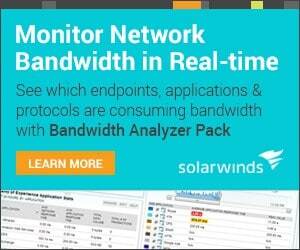 Server & Application monitor from SolarWinds helps to monitor any server or application. It is particularly useful for MySQL databases because it is proactive and helps to fix issues before they become major problems. It is a popular choice due to the following features. Monitors the performance of applications, regardless of whether it is in the cloud or in physical data centers. Saves time by automatically discovering applications and infrastructure. Comes with pre-built alerts and reports. Easy to set up. The entire process of downloading, installing and getting started takes less than an hour, and no professional service is required. Identifies the root cause of problems and gives appropriate suggestions. It’s built-in templates provide best practices for your security and performance. 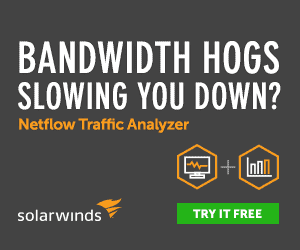 Offers the option to integrate with SolarWinds Virtualization Manager to get deep insights into the issues. Allows to import your custom scripts to monitor applications. Automatically discovers and even remotely manages hardware and software assets in any workstation or server. Requires Windows Server 2012, 2012 R2 and 2016. IP address version it supports are IPv4 and IPv6 implemented as a dual stack. Requires .NET Framework 4.6.2 or higher. Supports a web console screen resolution of 1024 by 768. Web console browser include Microsoft Internet Explorer 11 or later versions with Active Scripting, Microsoft Edge, Firefox 52.0 or later and Chrome 58.0 or later. MySQL monitoring tool from PRTG is another comprehensive tool that is ideal for monitoring your MySQL databases. What makes them so ideal is their below-mentioned features. PRTG keeps a constant eye on the critical MySQL databases to ensure that the downtime is minimal through an array of different sensors and monitoring parameters. It sends alerts immediately when any of the performance metric goes below the threshold limits, so you can fix the problem right away. These alerts are sent through emails, SMS and push notifications on your smartphone. It also monitors other key metrics that determine the health of your MySQL database. This measures the time taken to establish a connection, speed of execution of SQL queries, handling transactions and more to give you a complete insight into the health of your MySQL databases. You can even monitor specific data sets such as data generated on a particular day. To do that, you can define your SQL queries in PRTG tool, and in turn, the tool will monitor their values for you. You can set customized threshold values to monitor the performance of your database. You can create custom reports and even set a schedule to create report in a particular format. For example, you can ask the tool to create a weekly report every Friday at 5pm that contains the execution time of SQL queries over that week. The system requirements for this tool depends on the number of sensors you install per core. Here is a table that details the system requirements for each option. Contact the sales team if you plan to install more than 10,000 sensors. The cost also depends on the number of sensors you install. Besides this sensor based pricing, Paessler also offers two packages. the XL1 Unlimited allows you to install any number of sensors on one core installation and it costs $14,500. XL5 Unlimited, on the other hand, allows you to install any number of sensors on five core installation and it costs $60,000. ManageEngine’s Applications Manager is an integrated application monitoring tool that is ideal for monitoring all servers, applications, databases like MySQL database management system, big data stores, ERP packages, virtual systems and cloud packages. It is based on a single install and database architecture, which means, there is no need for any pre-installs. Monitors more than 100 key performance Indicators and Sensors such as response time, availability and memory utilization. As a result, even the slightest problems will be reported right away. Discovers applications with a single click. Sends notifications through email and SMS. You have the option to automate resolution with custom scripts, SNMP traps and trigger actions such as start, stop and restart. Advanced reporting tools make it easy to create custom reports within just a few minutes. Fixes baseline values for metric and checks these values constantly for anomalies. Reports also help with capacity planning. It provides REST APIs to get the necessary data from Applications Manager. In fact, these APIs make it easy to integrate Applications Manager with other internal applications of your organization. Assigns different user roles for restricted access. A 30-day free trial is available at https://www.manageengine.com/products/applications_manager/download.html. At the end of the trial period, it automatically converts to a free edition with limited features, unless you purchase a commercial license. 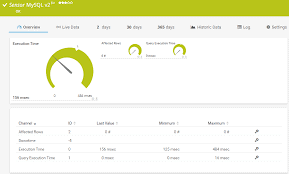 Nagios MySQL monitoring tool is a comprehensive monitoring tool that gives information about the availability, cache ratios and other key metrics of MySQL databases. Here are some of its important features. 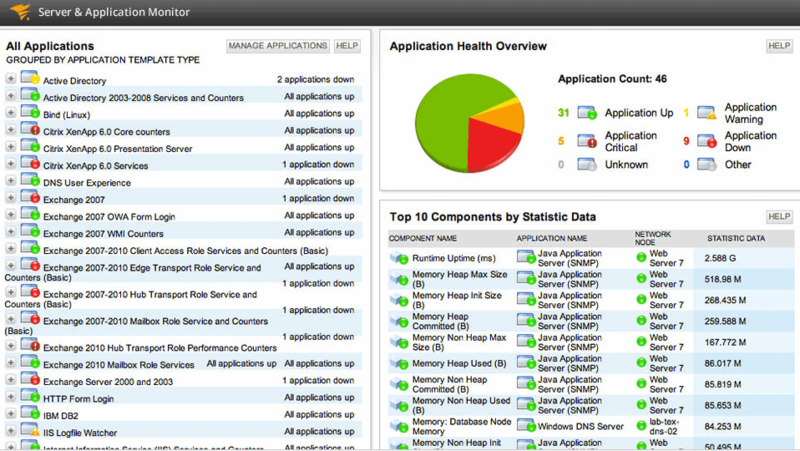 Increases application availability as it constantly monitors the health, and reports any issues right away. Improves database performances, as you can stay on top of many important metrics such as cache ratios. Detects outages, failures and database corruption quickly, so they can be fixed right away. Predicts the storage requirements and index performance to help with capacity planning. 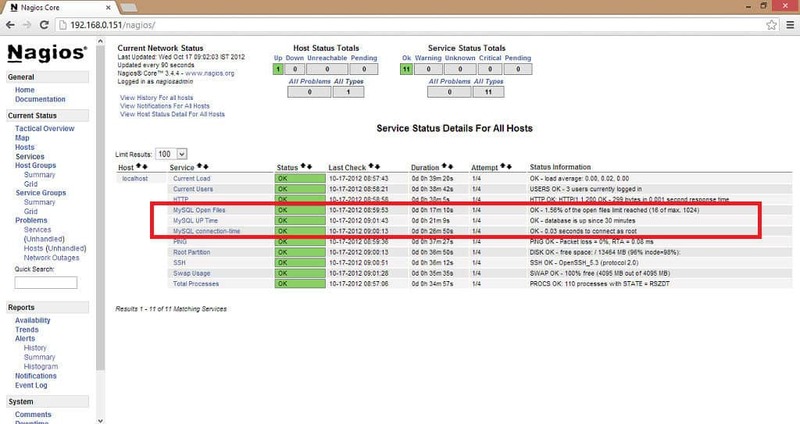 Gives the option to offload MySQL services from a central Nagios XI server to an external remote server. Comes with built-in templates and reports for easy reporting and compliance. 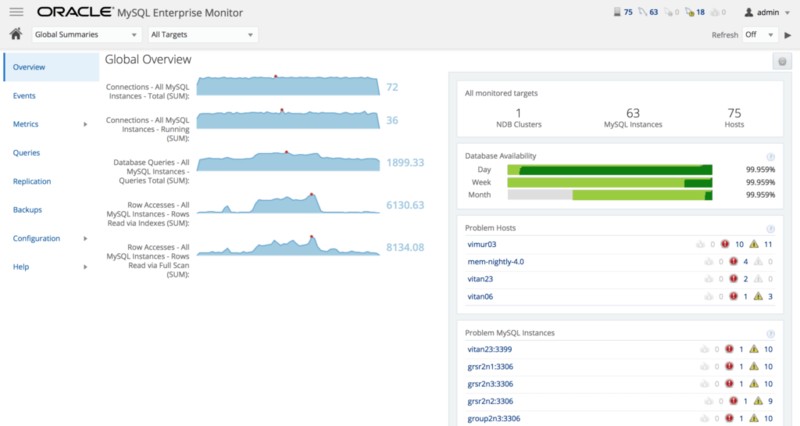 MySQL Enterprise monitor provides visibility into the performance and availability of MySQL databases in real-time. Here’s a look into some of its salient features. Installation is easy and you can start using the tool within just 10 minutes. Policy-based administration gives better access control. Provides automated guidance on how to fix problems such as poor indexing, long running processes and more. This guidance comes from 14 advisor groups and more than 225 advisors. You can also create custom advisors. Easily identifies trends for individual databases from your dashboard. Sends alerts based on customizable thresholds. Offers real-time monitoring for key metrics of your database. Monitors MySQL resource utilization, according to different users. Sends an alert when the capacity is nearing its limits, so you can avoid potential problems. Creates a list of SQL queries that have used the maximum resources over a user-defined time period. Automatically detects changes in MySQL cluster topology. Monitors MySQL Enterprise firewall activities to help you stay on top of any security vulnerability. Allows you to get complete information about backups. The user interface provides an excellent user experience. VividCortex is a company that specializes in database monitoring. Its MySQL Analyzer tool helps you to capture and understand every single transaction, so you can always stay on top of its performance and resource consumption. Here are some other things it can do for your organization. Measures every query, process and metric on your database. Provides deep insights into your database performance. This tool is a safe and non-intrusive way to get a better idea of your query workload. It is built on VividCortex’s patented algorithms that includes its network traffic capture technology. It is ideal for Linux operating systems. 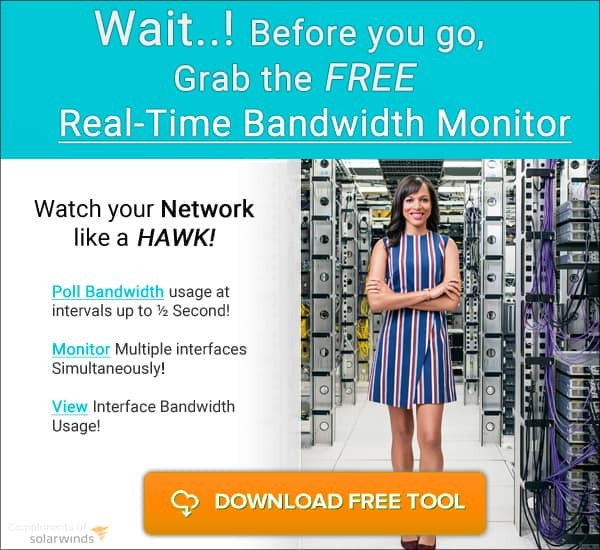 Measures many different performance Metrics and Sensors such as latency, throughput, index usage, I/O, CPU usage and more. Captures around 10,000 metrics every second. Its dashboard gives a detailed view of all MySQL databases, including query execution. Does not require much storage or CPU processing because it is a hosted database management service or SaaS. No upfront costs, CAPEX or depreciation is associated with it. It is upgraded and updated all the time, so you get new features automatically. Its auto-discovery feature discovers networks and devices. Installation is simple and requires only a single command. Uses advanced big data platform to give you regression analysis and queuing theory. This way, you get the minutest details of your server’s performance. State-of-the-art reporting feature provides insights for addressing issues and for capacity planning. A customizable dashboard gives you more flexibility over what you want to see. You need to have the following in place for VividCortex to work. Command line access to the server with root privileges. It offers two editions – standard and premium. The standard edition costs $249 a month while the premium edition costs $399 a month. This price is for every instance and you’ll be billed annually. 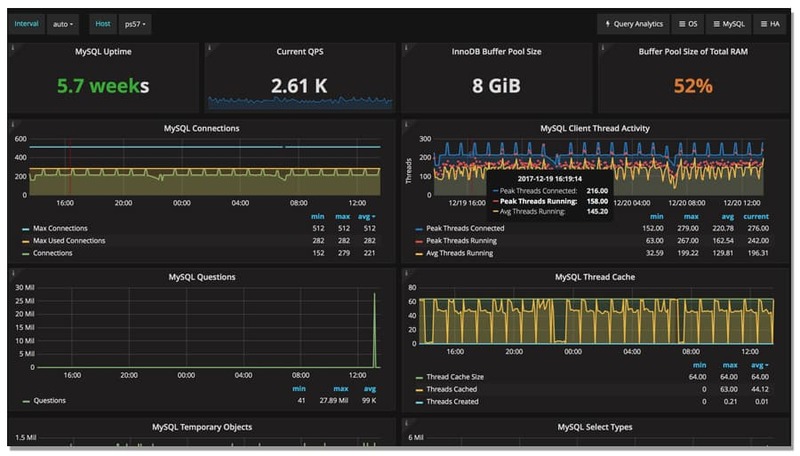 MySQL Monitoring Tool from Monyog is a powerful tool that allows you to keep track of everything that is going on in your MySQL database in real-time. Its features include the following. Allows you to monitor each query in real-time. Instantly identifies the cause of a sudden spike in any MySQL database. Makes it possible to identify an issue and fix it right away, even before it impacts users in any way. Tracks all changes made to MySQL global variables using the configuration manager. Monitors different metrics to make it easy for you to identify the root cause of performance issues. Allows to track and compare different versions of the configuration file. 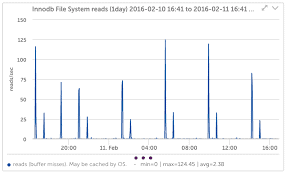 Reduces unnecessary CPU usage time as well as the query execution time. Sends notifications through email, SNMP traps, Syslog and through Pagerduty and Slack apps. Provides the option to configure or even kill SQL queries that take a long time to execute. You can set the threshold time as well. Advanced dashboard settings displays different information within the same window pane. Lets you view different metrics using RDS RST API, CloudWatch API, etc. Charts can be customized to meet your specific requirements. You can even expand a particular chart to find the information you want about a past event. Displays replication hierarchy of servers. Gives the option to switch from graphical to tabular view at any time. More than 600 monitors and advisors monitor the different metrics. You can rest assured that the monitoring is in safe hands. There are three editions, namely, Professional that costs $199, Enterprise that is priced at $299 and Ultimate priced at $399 respectively. Here’s what you get for each. In addition to the features in the professional edition, you also get the following. This version comes with all the features in Enterprise edition and the following. Percona Monitoring and Management tool is a free and open-source software that manages MySQL, MongoDB and MariaDB databases. You can run this tool in your own environment, so you’ll have maximum security and reliability. Provides a thorough time-based analysis for MySQL. This analysis helps you to better understand the health and performance of your database. Uses a client/server model, which means, you’ll have to download and install both the client and the server. Query Analytics (QAN) tool stays on top of the execution time of queries. You can even get details of SQL queries that take a long time to execute, and understand their root cause. Gives a historical view of the different parameters that are critical for the optimal performance of a MySQL Database Server. Offers point-in-time and historical visibility of MySQL database performance. Maps queries against metrics to give you the pertinent data to make important decisions. Displays current SQL queries and highlights issues to help you improve the performance of your database. Open-source and free to use. LogicMonitor MySQL Monitoring tool makes it easy to monitor your MySQL database and its associated infrastructure. It requires no configuration. Simply download and start using it. Monitors many critical MySQL metrics such as MySQL Query Cache, MySQL Tablescans and MySQL InnoDB statistics. Provides weekly and monthly reports. Live support is available around the clock and this is backed by a vibrant community. Customizable dashboards provide comprehensive and aerial view of different metrics. Comes with a single sign-on and two-factor authentication for greater security. There are three editions – Starter, Pro and Enterprise. Contact the sales team at https://www.logicmonitor.com/pricing/ for pricing. 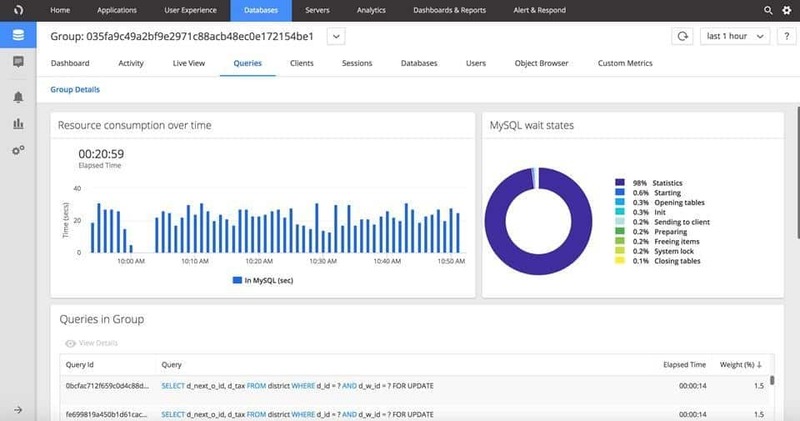 AppDynamics MySQL Performance Monitoring tool is a comprehensive tool that works around the clock to give you deep insights about MySQL databases. Real-time visibility helps to get to the root cause of a problem quickly, so you can resolve it right away. Displays the delta graphs of MySQL servers throughout the entire organization. Metrics are collected and compared against established baselines to identify deviations. Customizable charts helps to know when the performance exceeds the historical baseline. Sends alerts and notifications when any metrics goes beyond the pre-determined threshold limits. Allows to quickly troubleshoot issues with a simply one-click SQL statement analysis. Gives comprehensive details of the wait and execution time of queries. Provides visibility into the objects and configuration of MySQL database. AppDtnamics offers two plans – Lite Plan and Pro Plans. Lite Plan is free to use and offers only limited units per module. Also, data retention is limited, but you’ll have full access to the documentation, community and other resources. Both the plans start with a free 15-day trial. If you make a purchase, your software is given the corresponding access to different features. Otherwise, you continue with the Lite plan. 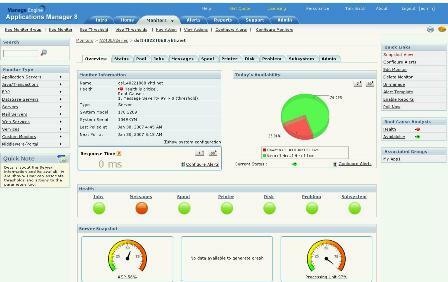 Zenoss MySQL Database ZenPack provides status and performance monitoring of MySQL servers. Discovers MySQL entities based on the attribute, tag and collection attribute of MySQL servers. Monitors events and sends triggers, if necessary. Each trigger will be accompanied by a pertinent message to make it easy for you to understand what’s going on. Along with Zenoss Service Dynamics product, it provides service impact capability for MySQL. To use, you have to setup connection and bind it to the device containing MySQL servers. Monitors different MySQL database and server components. The following attributes are collected every five minutes and the average is calculated and graphed every second. This is an open-source product and is free. However, support is available only for commercial customers who have an active subscription. MySQL OpsPack is a monitoring tool that keeps an eye on many important performance metrics of MySQL databases, so you can get good visibility into its performance. Keeps an eye out for any change and every change and notifies the same in the form of alerts. Setting up and configuration is easy. Comes as a part of the larger monitoring tool called OpsView Monitor. Monitors the following important performance metrics. In short, MySQL Monitoring Software & Tools are essential to monitor the different metrics of your MySQL databases to ensure that it is in a healthy state always. Since MySQL is a critical resource that powers many of your applications, having a tool for monitoring your MySQL databases can greatly reduce the workload of DB administrators and can also help you address issues quickly.